Home › Blog › Fish, Ski, or Camp Overnight the Axopar 28 T Does It All. Specialty boats tend to excel in one area while lacking desperately in all others. These single-focus boats often find themselves at dock more than at sea, and for a new boat owner can be quite limiting. A boat designed for skiing is rarely equipped for fishing, a fishing boat often lacks the comforts of a cruiser, and a cruiser can leave you behind with a sincere lack of power. The last thing you want is a boat your family and friends won’t enjoy. Enter the Axopar 28 T. Designed from stem to stern to perform well under all conditions; the boat is packed to the gills with comfort, style, and functionality. Today’s marketplace is flooded with boats that make wild claims but quickly prove themselves down and out. The Axopar shines where others have tried and failed. Available in a handful of size options and a variety of trim packages, the Axopar line-up can be customized to suit your style and needs. If you’re looking for an Axopar boat in Broward County, it’s likely you already know exactly what you want and need from your watercraft. The 28T places a great degree of focus on maneuverability in a luxury package. With twin Mercury outboards and a carefully crafted bow, the boat handles like a smaller boat and turns with ease. A responsive throttle sends power where it needs to be when you need it. Thanks to the expertly designed hull you’ll enjoy a smooth ride no matter the weather. With ample space to move about the craft, Silvertex seats, T-top, convertible bed and elegant lines, this one is sure to impress. The recipient of countless awards for class and performance, a few moments with the boat will redefine your expectations and is sure to raise the bar. Finding an Axopar boat for sale in Palm Beach can be an adventure. With most Axopar boat dealers selling out quickly after listing, it can be easy to get discouraged and go with your second choice. 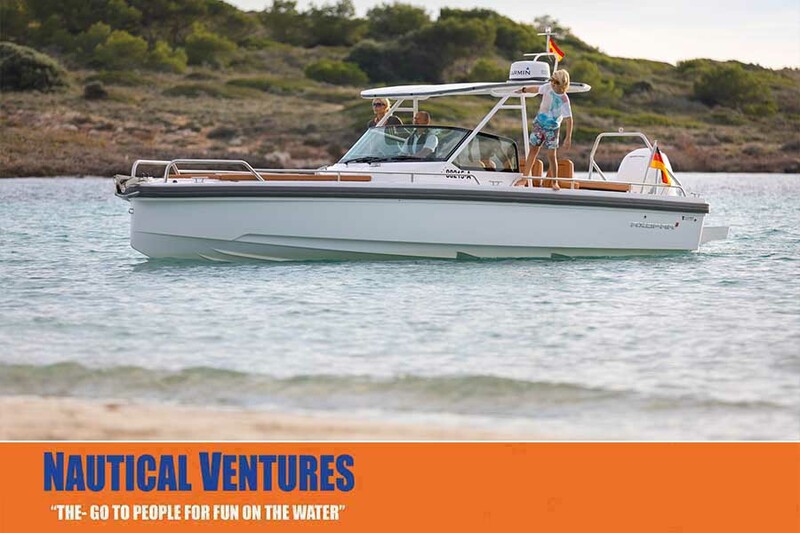 In recent years, Nautical Ventures has stepped up to the challenge and is now the largest stocking Axopar dealer in the country. You can browse from the comforts of home thanks to their up to the minute online inventory. As units move quickly, this becomes a valued tool for buyers on the hunt for the best deals. A marvel to watch, a pleasure to command, and a legend in boating circles, the Axopar 28 T T-top screams class and performance. The best Axopar boat review is the one you make yourself! Be sure to stop into Nautical Ventures today and discover what you’ve been missing!